This is the first of a three-part blog post. In the first part, we’re going to review the concept of energy landscapes, which some of you may already be familiar with. In the second part, we’ll discuss how a concept from physics, called a partition function, can help us think about energy landscapes. 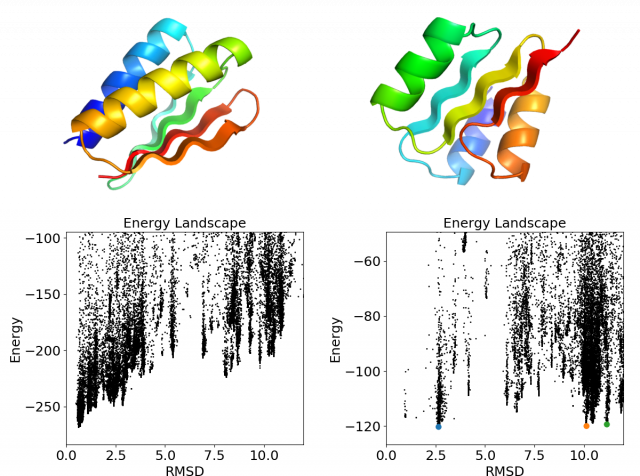 In the last part, we’ll propose a way that we might use these concepts of energy landscapes and partition functions to improve protein design in Foldit. There’s a problem with the way we currently design proteins in Foldit—and not just in Foldit, but also in Rosetta. In fact, it’s a problem in any protein design strategy that optimizes the absolute energy of the design. This strategy is the premise of a Foldit design puzzle. The Foldit score measures the absolute energy of a solution (with a negative multiplier), so that when players compete to find solutions with the highest score, they are actually competing to find solutions with the lowest absolute energy. However, the success of a protein design (i.e. whether or not the protein folds) does not depend only on the absolute energy of the design. Rather it depends on the protein’s energy landscape. The energy landscape is a concept we use to think about all the possible ways that a string of amino acids can fold. As any Foldit player knows, there are a lot of different ways to fold up a string of amino acids, and they all have different energies (or Foldit scores). We can imagine the energy landscape as a surface where every (x,y) coordinate represents a different fold, or state, and the height of the surface (the z-coordinate) represents the energy of that state. In some places there will be hills, which represent states with a high energy (low Foldit score), and in other places there will be valleys, where folds have a low energy (high Foldit score). One of the reasons we like the analogy of energy landscapes is that we intuitively understand how things tend to “prefer” low points in the landscape. If you place an object randomly on the energy landscape, it will tend to slide downhill, from a high-energy state to a low-energy state. If we consider the effect of thermal motion that is constantly jostling around the object (imagine a Mexican jumping bean that randomly jumps around the landscape), then the object will explore all the different valleys of the energy landscape. Nevertheless, the Mexican jumping bean will spend the most time in the deepest valleys of the landscape. A protein behaves the same way in its energy landscape. At room temperature, there is a considerable amount of thermal motion that allows the protein to explore its energy landscape, although the protein will spend the most time in the states with lowest energy. Every amino acid sequence has a different energy landscape, with different valleys in different places. When you mutate amino acids in a Foldit puzzle to find higher scores for your design, what you’re really doing is looking for an energy landscape where your design is in a deeper valley. However, the Foldit score only tells you about the energy of your designed folded state—or the “depth” of your desired valley. 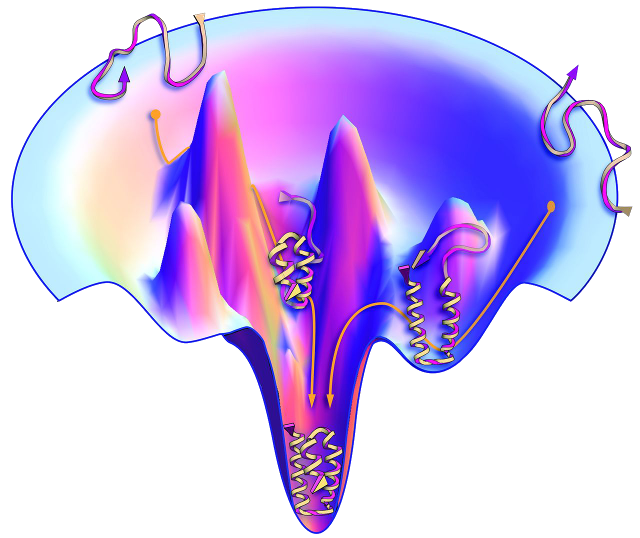 What we’re not considering in Foldit is the rest of the landscape, and whether there might be other low-energy “decoy states”—other deep valleys for your protein to explore. This is a difficult problem to solve because the energy landscape for a protein is vast. It’s difficult to account for the decoy states because we don’t know what they might look like. We don’t know where to search in the energy landscape for other low-energy valleys, and the landscape is too big to search exhaustively. As many of you are probably aware, a lot of the recent De-novo Freestyle prediction puzzles have targeted Foldit player-designed proteins. The purpose of these puzzles is to look for low-energy decoy states, or alternative valleys in the energy landscape. We already run Foldit designs through Rosetta@home to look for decoy states—and for the most part, Rosetta@home seems to do a pretty good job. But occasionally Foldit players find solutions that Rosetta@home misses. The protein on the left is a design originally from Puzzle 1331; the protein on the right is a design from Puzzle 1239. Beneath each cartoon protein structure is a scatter plot with the results from corresponding De-novo Freestyle puzzles that we posted using the sequence of each design. Each black point represents a solution, plotted with respect to its RMSD to the folded state (x-axis) and its energy (y-axis). Together these points give us a profile of the energy landscape for each protein. We see that the design on the left has a “funnelled” landscape, such that the lowest-energy solutions are those close to the folded state (RMSD close to zero) and solutions very different from the folded state (large RMSD) all have higher energies. In the design on the right, however, Foldit players identified a number of decoy states that are very different from the folded state (large RMSD), and have energy just as low as the folded state. These decoy states (marked with colored circles in the scatter plot) appear as “valleys” in the energy landscape of the protein. In each of the decoy structures, all of the α-helices and β-strands are there, but it appears there is some ambiguity about where the helices should go. According to the solutions from the De-novo Freestyle puzzle, the three α-helices can fold in different arrangements around the central β-sheet, and all of these arrangements have similar energies. Since all of these states have similar energy, the protein will not have a strong preference for any single one of them. Both of fiendish_ghoul's proteins were designed by optimizing their absolute energy, but the protein on the right has a problematic energy landscape. If we made these proteins in the lab, we would expect the protein on the left to be well-folded, and to spend most of its time in the designed state, since it appears to be the only deep valley in the landscape. However, we would expect the protein on the right to be poorly-folded, and to spend its time sampling all the different decoy states discovered by Foldit players. Check back on Monday for the next blog post, where we’ll discuss these energy landscapes in more detail! WeFold paper on CASP11 has just been accepted! 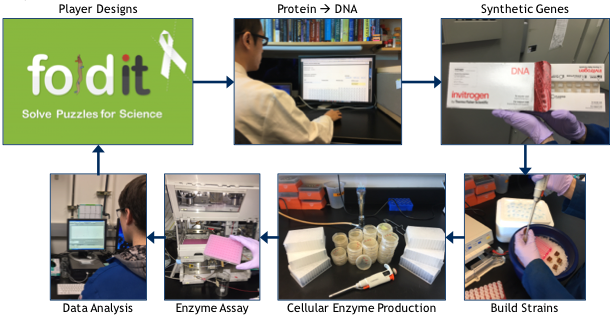 The followup paper to the first WeFold experiment was just accepted this week in Nature's online open access journal that covers the natural sciences: Scientific Reports. The paper is titled: "An analysis and evaluation of the WeFold collaborative for protein structure prediction and its pipelines in CASP11 and CASP12"
and just as with the first WeFold paper about CASP10, Foldit played a very large part in CASP11! In order to publish these results, however, we must now abide by the new authorship policy that journals have now implemented requiring author names and affiliations for all authors. Previously, we had used "Foldit Players" (or Players, F.) to represent all of you. Similar to Foldit's previous publication in Nature Communications, for this paper you will all be under the group consortium: "Foldit Players", and anyone who played a CASP11 puzzle has the option to list their complete real name (we cannot use Foldit usernames). We would like to emphasize that this is completely voluntary, as we will of course also have a statement in the acknowledgements thanking all Foldit players, just not by name. Today marks the 10-year anniversary of Foldit’s launch on May 9, 2008! In the past decade, Foldit players have advanced protein science by accurately predicting the structure of a viral protein1, by developing an algorithm for protein modeling2, and by redesigning a protein enzyme with improved activity3. 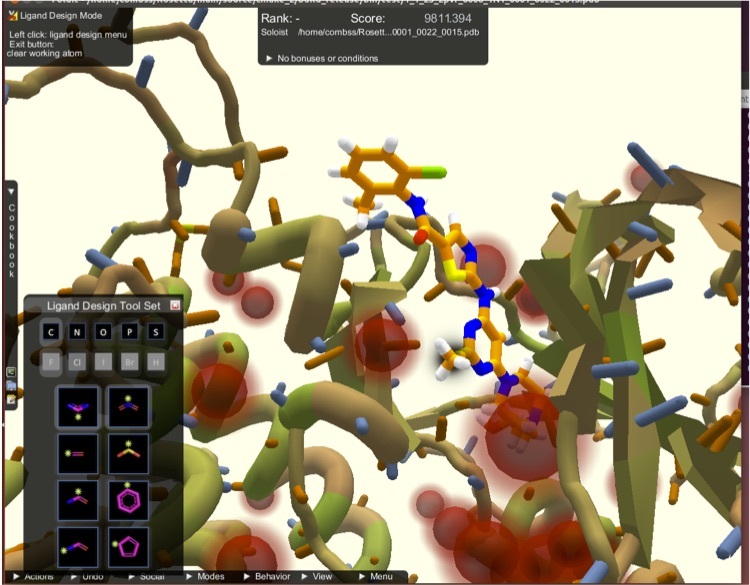 Foldit players have shown that they can refine protein models better than sophisticated computer programs4, and that they can interpret electron density maps as well as expert crystallographers5. We have high hopes for the next 10 years of Foldit, and can't wait to see what Foldit players will discover next! Most recently, Foldit players have been designing brand new proteins from scratch. The ability to design proteins is a big milestone for Foldit players, and we’re excited about the new types of problems that we can start to tackle with protein design in Foldit! This achievement has been a long time in the making—below you can review previous blog posts to follow this progress over the last four years. Play the latest design puzzle now! 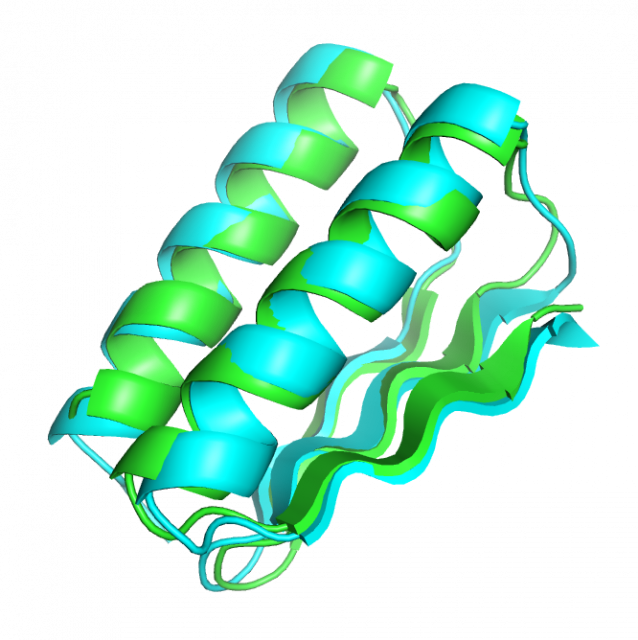 A high-resolution crystal structure (cyan) aligned with the design model (green) shows that this protein folds up just as it was designed by Waya, Galaxie, and Susume. The protein backbone aligns to the design with a Cα RMSD of 1.1 Å, and the sidechains in the protein core pack just as intended. We’re also excited to ramp up small-molecule design in Foldit, allowing Foldit players to create new ligands that could bind to protein targets! Play the latest small-molecule design puzzle now! 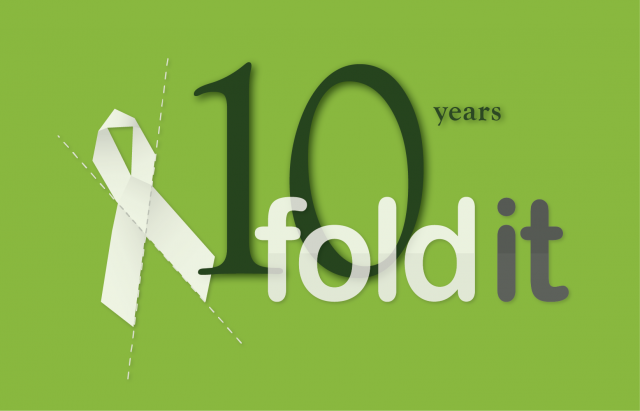 We'd like to thank all the Foldit players that have contributed to Foldit over the last 10 years! None of this would have been possible without you! Happy folding! 1. Khatib, F. et al. 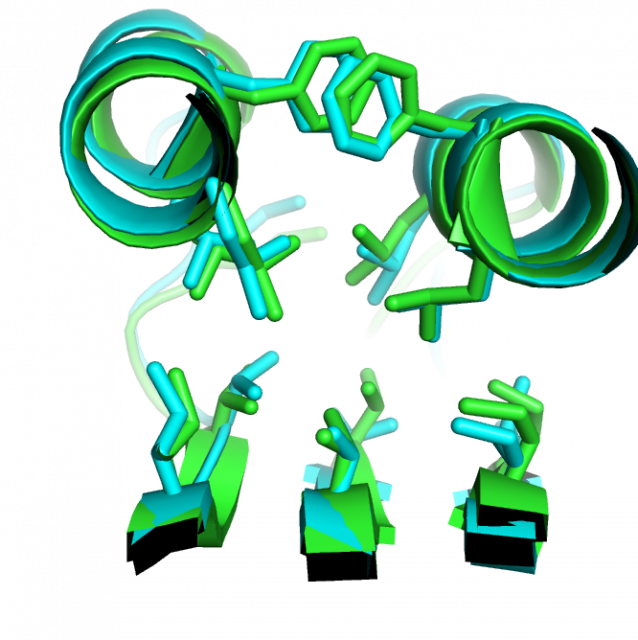 Crystal structure of a monomeric retroviral protease solved by protein folding game players. Nat Struct Mol Biol 18, 1175–1177 (2011). 2. Khatib, F. F. et al. Algorithm discovery by protein folding game players. Proc Natl Acad Sci U S A 108, 18949–18953 (2011). 3. Eiben, C. B. et al. Increased Diels-Alderase activity through backbone remodeling guided by Foldit players. Nature Biotechnology 30, 190–192 (2012). 4. Cooper, S. et al. 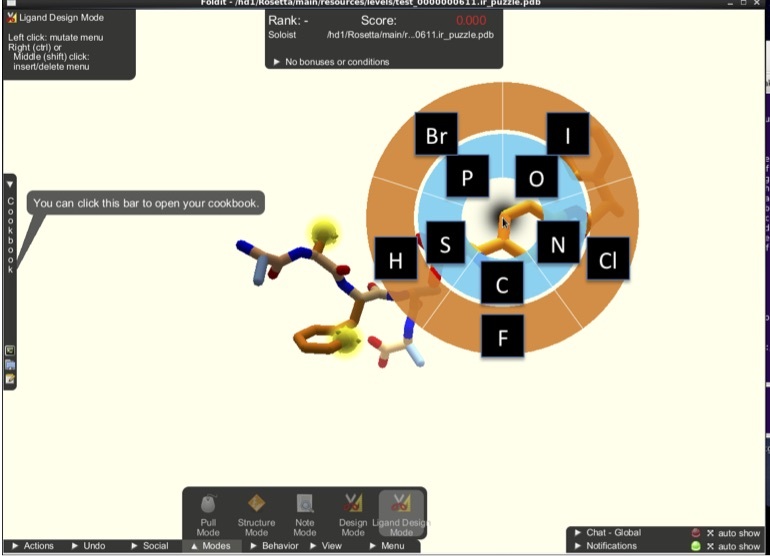 Predicting protein structures with a multiplayer online game. Nature 466, 756–760 (2010). 5. Horowitz, S. et al. Determining crystal structures through crowdsourcing and coursework. Nat Commun 7, 12549 (2016).